Readers, I faced my fears this week. Never again will I be scared by a whipped egg white. There. Said it. Meringues have been my baking nemesis for a very long time. So much so, I’ve avoided making them. However, when Sugar and Crumbs contacted me and asked me to become one of their regular bloggers, I knew I had to get over my meringue fear. Challenge one… something love related for Valentines Day. I have to confess, we aren’t huge Valentines fans in this house. I’m still a hopeless old fashioned vintage girl with a love of all things looooove but I’m not big on spending a fortune in an overpriced restaurant. Valentines should be about showing someone you care and not spending a fortune doing so. Therefore, for Mr What Claire Baked, I’ve made valentines love nests. 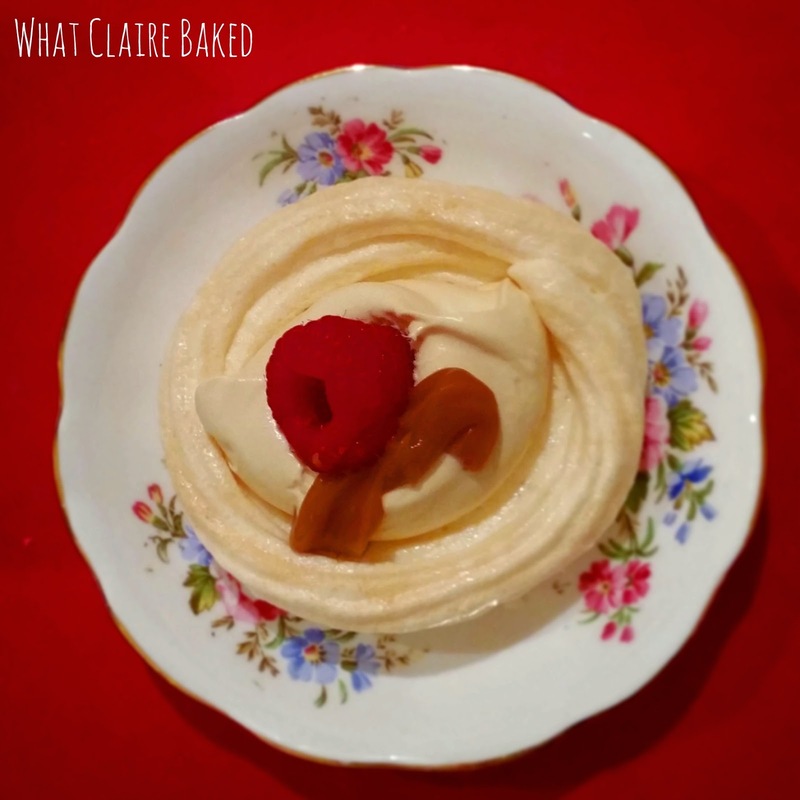 It’s a meringue nest filled with salted caramel cream, topped with fresh raspberries and a drizzle of sauce. As this is a post created for Sugar and Crumbs, I’d better mention I used their raspberry ripple flavoured icing sugar in this recipe. 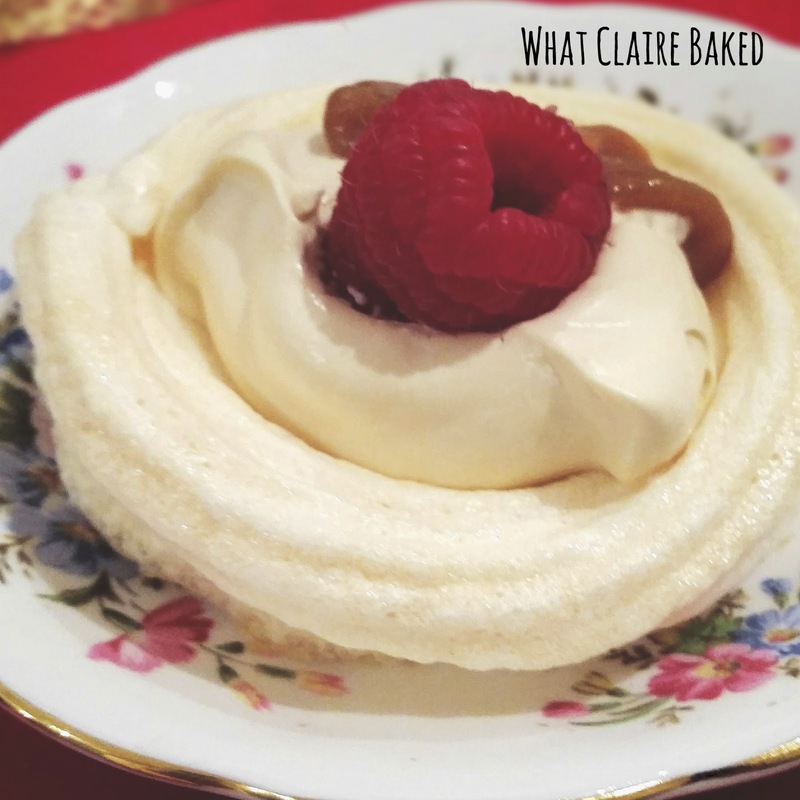 I am a huge fan of raspberry with meringue – it reminds me of pavlova, which I can still remember trying for the first time aged 5 at my Dad’s cousins house. The raspberry ripple icing sugar does smell of fresh raspberries and when I opened the oven door, I had a waft of raspberry coming towards me. Delicious. I thoroughly enjoyed working with this variety from the Sugar and Crumbs range. 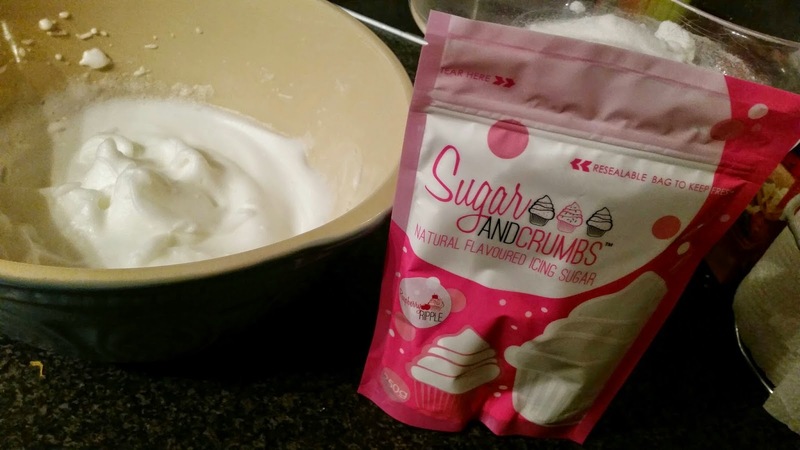 The meringue recipe came from Sugar and Crumbs and I came up with the filling ideas myself. Use a clean bowl (not plastic, a Mason Cash is great for this) and wipe round with a kitchen towel with a splash of lemon juice. This ensures there is no grease in the bowl. Separate your egg whites and add to the bowl, using an electric mixer, whip the whites until fluffy and stiff peaks have formed. Weigh out your sugar and add in a bit at a time, whisking between additions to ensure it’s blended with the white. Turn the mixer up to high speed for this part. 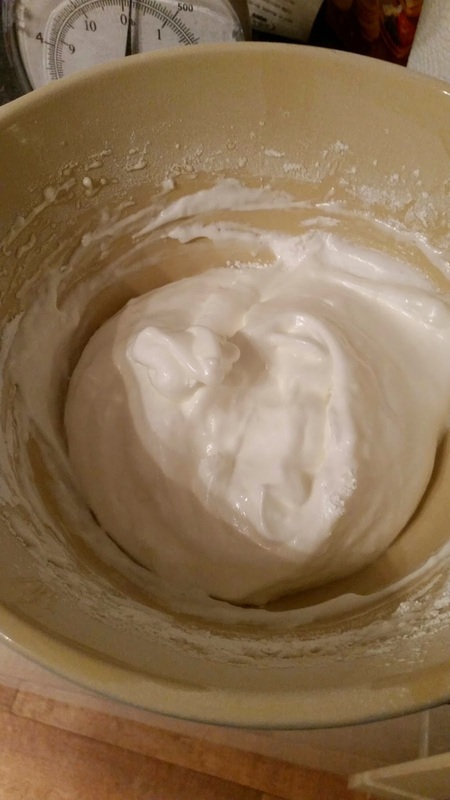 Once all sugar is added, your meringue should be thick and glossy. 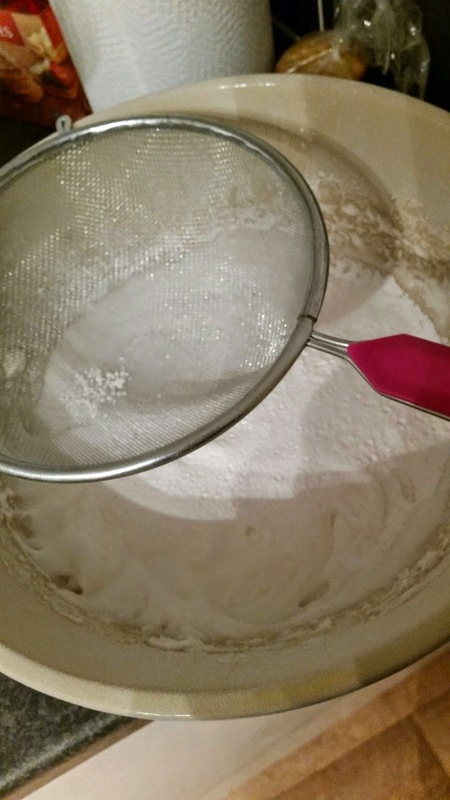 Sift in 115g icing sugar and using a spatula gently fold in the icing sugar. Be careful not to knock out the air you have added to the mix. Transfer the mix to a disposable piping bag fitted with a 1M/2D nozzle. Preheat the oven to 100c fan/Gas 1. Line a baking tray with non stick baking paper – not greaseproof. Pipe a tight, flat swirl. This will be the base of your nest, then pipe round and up to form the walls of the nest. 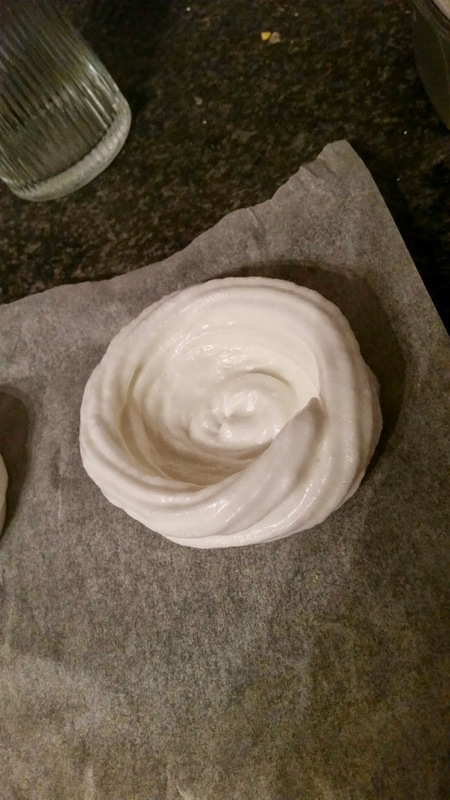 The meringue should hold its shape by itself and not collapse. Transfer to the oven and bake for around 1h 30 minutes until the meringue is hard and sounds hollow when tapped. Keep an eye on the meringue to ensure it doesn’t burn. Cool in the oven with the door closed for several hours if you can. Whilst meringues are cooling, make your filling. 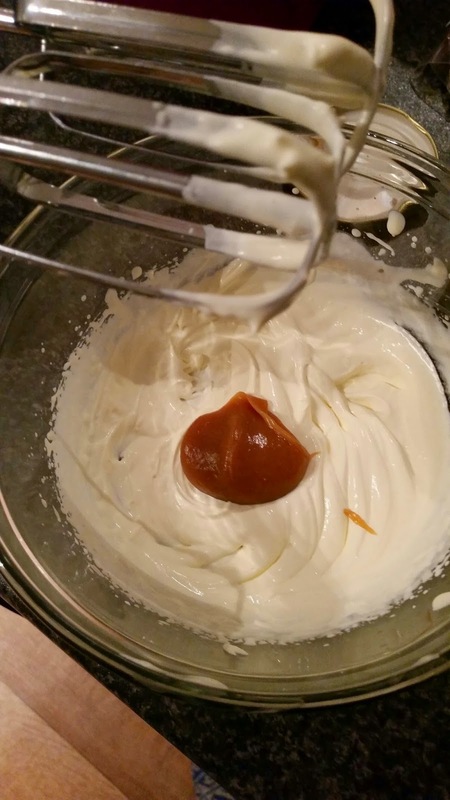 Transfer double cream to a bowl and whisk up till almost fluffy, using an electric mixer. Just before it gets to your desired consistency, add in a teaspoon of salted caramel sauce and continue to mix until combined. Set aside. Once meringues are cooled, fill with a dessert spoon of cream and top with several fresh raspberries. Drizzle a little salted caramel sauce over the top and serve. Disclaimer: I received the items free from Sugar and Crumbs to bake with. Any opinions expressed are my own. I'm entering this recipe into Treat Petite, hosted this month by The Baking Explorer. Hmm this sounds good, and quite easy to make. Thanks for posting this up. Hi Simon. I'm not the best at meringue and even I managed it so assuming it can't be too difficult! Good luck! Loving the flavour combination here, total sugar addict heaven in my eyes! And well done on conquering meringues, not that scary right? Thanks for entering into Treat Petite!